Marisol is an artist. She loves to paint and has a little art gallery at home where she displays all of her best work. She dresses how she thinks an artist should dress and she wants all of her friends to embrace their creativity too. 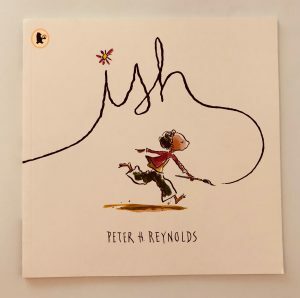 If you’re a fan of Peter H. Reynolds‘ books you may have already come across her as the encouraging little sister in fab story ‘Ish’. When Marisol’s teacher announces that the class is going to create a huge mural for the school library she is very excited. She can’t wait to get the paints out and get started! Together the class sketch out a giant picture and they each select a section to paint. Marisol excitedly declares that she will paint the sky. But there’s one problem – when she gets to the paint box there is no blue paint. Everyone knows the sky is blue, so what on earth is she going to do? 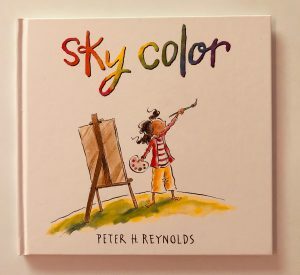 We love this book by Peter H. Reynolds and i’m not ashamed to say it made me cry the first time we read it! Vashti is a little girl who thinks she can’t draw. Whilst all of her friends paint and create in art class, she just sits and stares at the plain white paper, defeated. 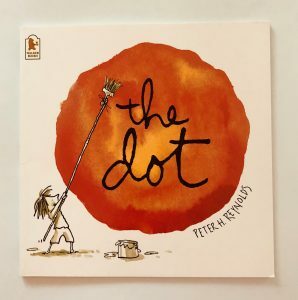 Her teacher challenges her to draw a dot in the middle of the page and then asks her to sign it. She jabs a dot with her pen, signs her name and then skulks out of the classroom. The next week when she walks in to the art room she sees her dot (and signature!) on the wall, displayed in a lovely shiny frame. Inspired, she sets out to draw a better dot and then a better dot and then an even better dot than that. Soon she’s so good at drawing imaginative, colourful dots that the schools puts them on display at an art show. Ramon loves to draw, and does so whenever he gets the opportunity. However one day his older brother takes a look at one of his pictures and laughs at him. Ramon had been trying to draw a vase of flowers but his brother can’t tell what it is so he scrumples up the paper and throws it away. He tries many more times but can’t seem to get it right so, with his brother’s laughter still ringing in his ears, he decides to give up drawing forever. His little sister Marisol wants to see what he has been drawing but, presuming that she just wants to laugh to, Ramon gets defensive and shouts at her. She runs away with a drawing in her hand and when he chases her he is surprised to see that she has his vase drawings all over her bedroom walls. She loves the images and this makes him see them in a different light. It is a vase-ISH, and this is what Marisol likes.